Olympic’s decking! This is a nice long section of Olympic’s pine decking. As with the staircase moulding, much of this was cut up into smaller segments; so very few really long sections survive. 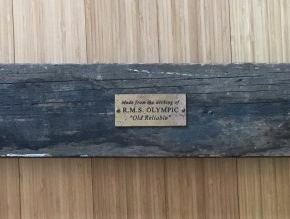 This pine decking comes directly to us from Olympic via the Haltwhistle paint factory. It measures about 46″.